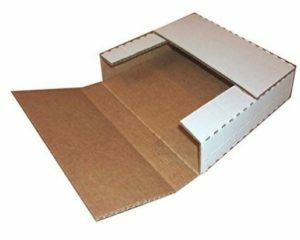 Record shipping boxes | Cardboard or Plastic to move Vinyl? Personal shipping is the first area where a record storage box will be useful. We’ve had moments when we wanted to ship vinyl records to friends or colleagues. Commercial shipping is another area where these boxes will help you. Stores that sell vinyl need shipping boxes for records to be able to safely deliver their products. Last but not least, you might need a vinyl box for storage purposes. Shipping boxes are usually quite resistant, so they are more than qualified for storage also. While using a special vinyl record storage cabinet or personalized record storage furniture is very stylish, not all of us have or can afford such items. Therefore, for the rest of us, we look for record storage ideas in different areas. LP shipping containers, usually made of cardboard, will also allow us to easily arrange our records at home. Shops usually keep their stocks of LPs in shipping boxes just because they can save space. 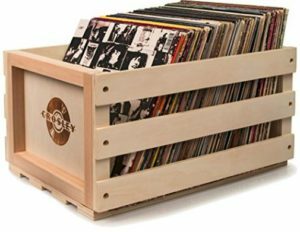 While most record crates tend to be focused on being stylish rather than practical, there are some crates which focus on these aspects. Especially the crates which can be locked and have rigid edges. Metal or plastic crates will protect your records during shipping. At the same time, you must be sure that locking mechanisms will handle the task. Also, the general reliability of the crate must be quite good. We would still recommend that you also pack the crate. During shipping, this might be thrown around quite a lot. Preventing any damage to the crate should be your main concern. Just make sure you buy a cardboard box in which you can insert the actual crate. 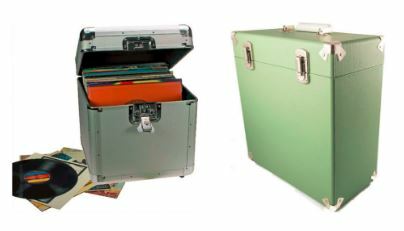 If you are an avid LP user, then we highly recommend you get at least one of these carrying cases. The fact that it is usually made of metal or even heavy duty plastic will help you keep your vinyl records safe. Such a case will fit around 50 LPs of 12” size. Getting a case for 12” vinyl will let you store both that size and smaller 10” vinyl. Sturdy construction with a combination of metal and tough plastic materials make it ideal for shipping or carrying it in even the toughest conditions. The soft fabric interior will cushion most shocks through which the case and records will have to face when shipped all over the place. The case opens both at the top and on the side. 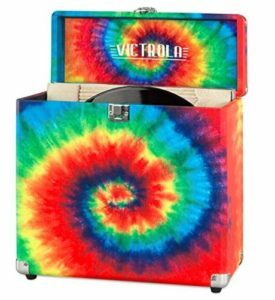 This makes it great for easy access and for finding your favorite record quickly. This kind of cases still offer a sturdy storage experience but are focus more on look rather than practical aspects. For most users, they will provide a safe storage space and we highly recommend them if you want to stand out. They will hold around 30 records at a time. In some cases, it will be a couple more in others a couple less. It can store records up to 12” and ⅓ rpm or the smaller ones, 10” or even 7”. Since it is focused more on looks, it will not have the heavy-duty capabilities of others but it will still stand most shocks. We recommend you also buy a cardboard box in which you can ship it. The nice finish it has could suffer during courier shipping since they are notoriously throwing things around. It only opens at the top, so it will not be as easy to find your records compared to a case which also open at the sides. But it’s still good enough we think. A cardboard vinyl box is great when you want to ship records around. As we also mentioned before, some shops also store records in such boxes. 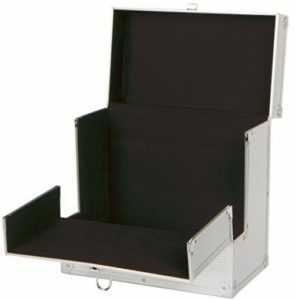 This is a cheaper alternative to a record crate or case. It might not offer the same protection, but in different circumstances, it will work just fine. The size of these boxes varies, ranging from a storage capacity of 5 to over 50 in one box. Boxes that can hold up to 5 vinyl records are usually made to ship records. Either you want to send them to a friend, or you are a record shop, these will do the job very well. Boxes that can fit over 50 records are usually made for record shops. Their suppliers use them to ship large quantities at a time. When you need vinyl boxes for moving, these will also suit you very well. In those cases, you need to store as many records in one box as possible. Lower volume boxes can be used at home for storage purposes. For example, there are containers that will hold around 20-25 LPs. These are great when you want to organize them based on music genre or even their release year. LP storage boxes made of wood are less and less used as time passes. Because they are made of wood they tend to be quite heavy and difficult to move around. These vinyl record crates are popular with music shops, giving the whole thing a more vintage look. They come in different colors, shapes, and sizes, with a decent storage capacity. Wood is the main materials these are built from, but you will get combinations of wood, metal and even glass on some designs. Because the design is their main focus, these will not be the practical approach to storage or shipping LPs. Keep this in mind when you think about getting such a crate or even building one. DIY vinyl record storage can become a very interesting weekend project. Just as with any DIY project, it will take time, effort and will also cost you some money. Even for a simple thing as a record crate, we highly recommend you do a bit of planning. The internet is full of resources on record storage ideas. Use these resources and compare them with what you want to achieve. After the planning is done, evaluate what materials, tools, and effort you have to put in. Throw in the financial costs and think again if it is worth it. If everything seems ok, go for it. Buy the materials and tools and start the work. In the end, you will be very proud of you and your work. And the end result will definitely make you feel accomplished. Please follow the link for an interesting DIY record crate project. Even if you don’t want your crate to be like that, it will give you good pointers for your own project. We also have articles on the storage of other items. For example, we provide great information about storing your photos. Also, you can learn more about archival boxes for book storage. Folding Chair Cart | Our favorite one caries 50 chairs!